Kenneth Robinson was born in Dunscar, Turton - just north of the Borough of Bolton at the time - on 9 October 1883. 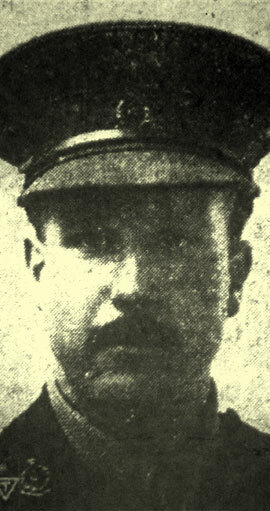 He was the son of James and Jane Drennan Robinson of Rock Field, 512 Darwen Road, Dunscar, Turton. His father, James Robinson, was a medical practitioner and surgeon in Dunscar and Bolton, as had been his grandfather and great-grandfather. Kenneth attended Bolton Church Institute from 10 September 1894 to around 1897. He then moved to Wellingborough School, Northamptonshire. He studied medicine at Manchester University from 1900 and did research in public health. He qualified MB (London) in 1907. From 1907 to 1914 he was in practice with his father at Dunscar and then briefly had his own practice in Llandudno, Wales. All four of his brothers also graduated from the University of Manchester Medical School. 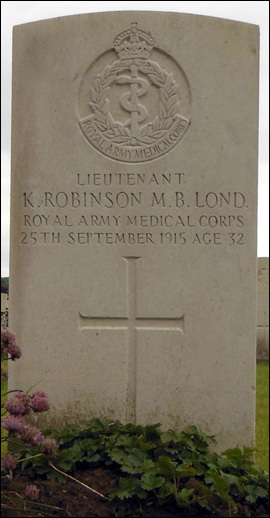 Kenneth took a commission in the Royal Army Medical Corps early in 1915. After training at Torquay, possibly for only three weeks, he arrived in France on 14 July 1915 and was attached to the 12th (Service) Battalion, Manchester Regiment. 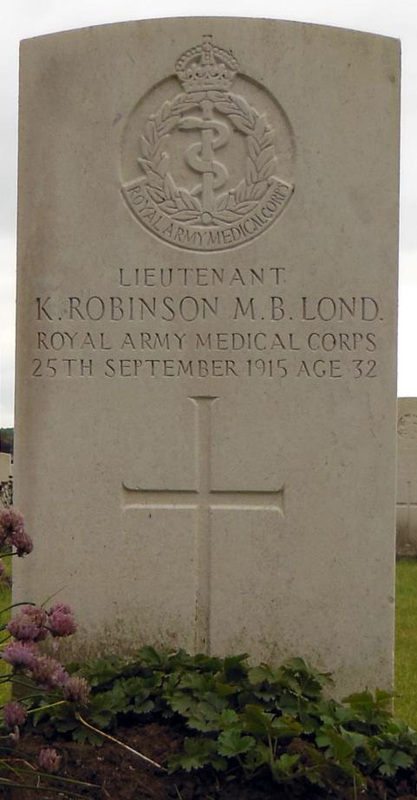 He was killed in action on 25 September 1915 in the southern area of the Ypres salient. Kenneth's brother, Marshall Robinson, served as a Captain in the Royal Welch Fusiliers in France and Palestine and was wounded at Loos. Kenneh's name appears on Dunscar War Memorial. A feeling of profound regret has been caused in the Dunscar and Astley Bridge district by the sad news, conveyed to the family yesterday, that Dr. Kenneth Robinson, second son of Dr. Robinson, of Dunscar, was killed in action in France on September 25th. Lieut. Robinson, who obtained a commission in the R.A.M.C. was attached to the 12th Manchester Regiment. At the time of joining the Army he was in practice at Llandudno. In communicating with Dr. Robinson’s parents, Major E. McFarlane, second in command of the 12th Manchesters, says:- “I regret to inform you that Lieut. Robinson, R.A.M.C., was killed about 9 p.m. yesterday (Sept. 25th), as he was proceeding from the Headquarters dug-out to dress a wounded man. All ranks in the battalion will feel the loss of this gallant officer, who had the interests of the unit so much at heart. It will, I hope, ease your distress, to know that he died at once and had no pain. He was a loyal and splendid officer, and was adored by every officer, N.C.O., and man in the regiment. He was very unselfish, and had no sense of fear. Indeed, he was about the best type of officer I have ever seen.” Major McFarlane added that the deceased was buried at 4 p.m. the following day. Dr Robinson, who was of splendid proportions, being over six feet in height, was 31 years of age. He was a former student at Manchester University, and qualified for the M.B. (London) in 1907, taking up practice with his father at Dunscar. Twelve months ago, however, he took a practice at Llandudno, At the beginning of this year he received a commission in the R.A.M.C. After a course of training at Torquay he left in July for France, where he saw much fighting. In peace times he took a keen interest in golf and cricket, and was a member of Turton Golf Club, and a vice-president of Eagley Cricket Club. He was also interested in Eagley Lads Club.